At some point in my life I have realized a simple fact: I can’t lose something if I always put it in the same place. Car keys? Always in a certain pocket of my purse. Glasses? Always on the bathroom counter or on the night table. Medicine? Always in the medicine cabinet by the office. I rarely lose things. However, this superb system comes with an interesting drawback. When an object is moved from its usual place, it becomes invisible. I am absolutely serious. I can be staring straight at it and I don’t see it. The floor dudes stripped the layers of epoxy off our floor while we were on tour. They stripped it in the pantry too. They moved the stuff from the bottom under the shelf space and they put it up onto the shelves, moving everything to make room. I will now pause so you have a moment to absorb the full horror of this. I spent five minutes in the pantry with a stupid look on my face and my thought process went something like this. “Where is canned corn? I know we purchased corn. I left it right there on the floor under this shelf. It is not there now. We had a large pack and there were at least six cans left. I know this because I had checked on the corn the last time we went to Sams and I specifically decided that we didn’t need anymore. Why can’t I see it? Did one of the kids come and take the corn? But if they had taken it, surely they wouldn’t have 6 cans of it. Did I give the corn to Kid 1 when she was moving in? I gave her a bunch of groceries. Does she and Logan even eat corn? Here is a picture of my rearranged pantry. You too can look for the corn with me. Feel my pain. Feel it. Also floors are still a mess. Crai. Yes. The children told me it was a collector’s item so I bought it. Gordon and I can’t have any – our breakfast is those glucerna shakes in the corner, but apparently the point of it is not to eat it but to have it and Instagram you having it. So it is kind of like the Mario cereal that is also an Amiibo? My kids did eat the cereal because marshmallows and they are 7 & 9. We cut the RFID area from the rest of the box once it was empty. Now we are debating printing the delicious Amiibo to hold it. Sometimes I love being Canadian. You see unlike the States. Canada has sugar limits on things like cereals. My mom has diabetes, and has to take three shots a day. It dosen’t stop us from having a bowl of Honey Nut Cheerios and yes, they use actual honey. Even though there is sugar in it. It is far less then what you would find in a lot of different types of American cereals. After a time of baffled looking around store shelves for something, and finally locating an item I’ve often blurted out “That’s no fair! It’s in plain sight!” It gets some baffled looks, but more laughter. My mom describes that phenomenon as, “If it’d been a snake, it would’ve bit you.” This is usually accompanied by her waving said item at me or my siblings while pointing to a shelf loaded up with more of the same. If you start in the back right corner, on the shelf that also has an amazon box, it’s the third big item. White bag of bags (??? ), looks like box of granola bars, then box of corn. Hope you enjoy, for a laugh, I found a copy of an old ’email story’ from years ago!! Recently, I was diagnosed with A.A.A.D.D: Age Activated Attention Deficit Disorder. I splash some water on the flowers, but most of it spills on the floor. So, I set the remote back down on the table, get some towels and wipe up the spill. Then I head down the hall trying to remember what I was planning to do. Ok, this had me dying with laughter and falling off my chair. It’s so true! Oh God, yes to all of this. So that’s what they call that .. I didn’t realize it was a thing ..
Lol. Through a series of events, I logged on to the blog page (using my phone), and I was distracted so I read the title of the post as Discombobu Ted. And I kept looling for the mention of a cat(?) named Ted in the article. I wish I could say this started with age, but it’s pretty much the story of my life. Oh, yeah, I’ve had days like that. That’s happened at work, too. By the end of the day I feel like I haven’t done anything but I KNOW I’ve been working all day. And this also happens at the grocery store. I grabbed a small cart because I didn’t have much to pick up, but lo and behold, my shopping went along the same lines. Oh, yeah, I need hot dog buns. Well, you can’t have hot dogs without chili. Ooh, they have the Snickers Clusters out for Halloween. No good premade salads, so I’ll have to make one at the salad bar. Oh, I should get something for breakfast. Two things happen. You overflow your shopping cart, and you forget the ONE thing you went to the store to get. Age isn’t really the problem. One of many instances, I was in my late 20’s and I found myself at the washing machine with the butter dish. The dirty dish cloth was in the fridge. lol this is me, too. I am especially bad at this when I’m trying to do work. I’ll be partway through one project, then see something else that needs attention, then something else, then something else… The list goes on! I love this story. I have the same problem. I spend some days wandering around my flat, saying “Focus, Focus, Focus” It is a challenger. brilliant story. Thank you. But I thought I’d share my “sort-of” fix. I carry a small spiral-bound notebook and pencil with me for a running (literally & figuratively) to-do list when I’m working around the house. Each day gets a page. I write down what I want to do (including things that didn’t get checked off on the previous day). Then as things come up, I just add them to the list. I keep looking at the list (and crossing things off as I finish them–very, very satisfying! I’m clearly a nerd…). And I really do get back to things. Love your pantry, still don’t see the corn. 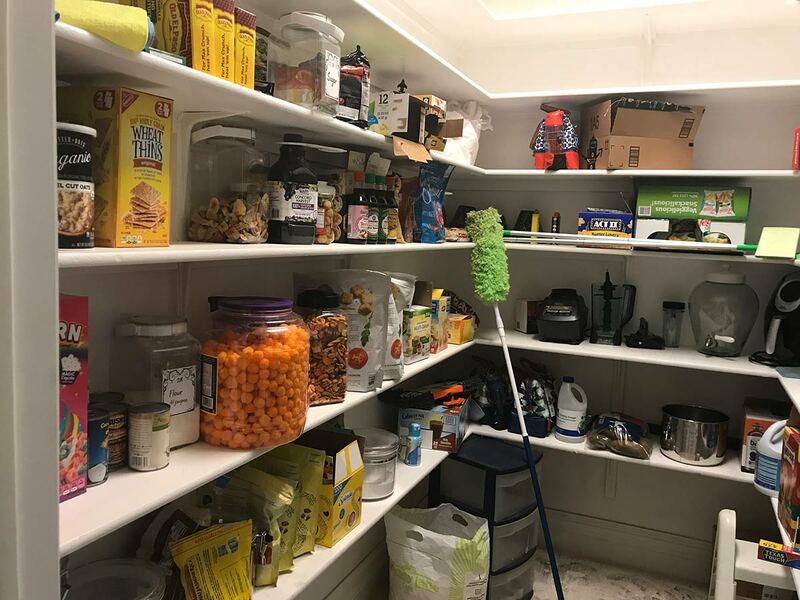 Seeing the jar of cheese balls and packs of things makes me suddenly miss being able to go to Costco or Sam’s… and I really don’t need a giant jar of cheese balls (Though if they were in the house they would certainly end up being eaten). Also this makes my decently sized pantry suddenly feel small… The kitchen is on the long list unfortunately. Those giant jars of cheese balls are the reason I avoid my local Family Farm and Home. They’re displayed on an end cap right by the entrance. Haven’t seen them at Costco, and please don’t give me their location! You don’t have to go to the store, you know. They’ll deliver right to your door. Bad enough Amazon delivers Barbara’s White Cheddar Cheese Curls . . .
How do you still have Wheat Thins in your house? Don’t they follow you around, sidling into your peripheral vision – a constant reminder that their delicious salty-crunchy-goodness is only steps away- leaving you incapable of concentrating on anything else, until you decide to eat them just so you can get something done? Wasn’t it on the top shelf in a white box? And I feel your horror. I hate when anyone moves my stuff…..it’s like where’s Waldo to find it! Don’t feel too bad, I was missing a pot yesterday. It was actually clean and sitting on the back burner of the stove rather than in the dish rack where I thought I put it. You could by a bar code scanner and place it in the pantry and link it by wifi to your computer. Then when items go in they get scanned and when they go out they get scanned. Then you’ll know. Just a thought. I’m so sorry but this caused me to laugh uncontrollably. I learned organization from certain jobs, internships, and volunteer positions I’ve held… but am otherwise disorganized. So for instance, I volunteered in a couple of zoos, where ideally we had a meat fridge, a fruit/veggie fridge, and a human fridge. My fridge has designated zones for meat, fruits/veggies, dairy, and leftovers, but things like condiments sometimes struggle to find their place in the world. Is ketchup a vegetable, or a leftover? I don’t know, I’ll put it in the middle and decide later. And if you’ve ever seen the, um, “organization” of the enrichment room at the zoo, you might understand the beauty that is my craft room. Organization is more of a theoretical entity than an actual thing that exists. I have a theory that it requires too much magic to maintain itself on this plane, but if I’m lucky it might manifest during the next flare. By my calculation, that will be about 2022. Condiments belong on the door shelf for small bottles of flavourful things — or the bin of small bottles of flavourful things, if that’s how you fly — as it isn’t what they’re made of but that they add to whatever they’re added to. If it’s any consolation, I can’t find the corn either despite my large desktop screen and panning across the photo at high magnification. We call this phenomenon The Great Ketuchup Bottle Mystery. How often can you look in the fridge – not find something – only to have someone move the ketchup and find it? “It’s right there…” Is the worst sentence! I feel your pain. I can look for an item for hours when they are right in front of me. I mean I happened to look at my phone while being on the phone! I don’t have a pantry, but I do have a large rack with shelving. It used to have wheels, but something happened and those broke. My pantry envy is strong. Your corn appears to be hiding from me too. Go to the local farm stand, they have corn. Reminds me of, I want to say it was Steve Wright, who always pointed out that of course the item is in the last place you looked. Would you keep looking after you found it? No, therefore, it’s ALWAYS the last place you look. After i have searched and searched and finally found missing object my ole man will say “bet you found it in the last place you looked”! DuH, of course i did. It usually was in the first place i looked also I just didn’t see it thus setting off a wild goose chase only to find it where i thought it was. GRRHRR! It’s like the washing sock syndrome…two socks go into the wash but one comes out of the dryer. You look in the washing machine…no sock…you look in all your clothes…no sock…you look in your fitted sheet…no sock (that’s when I washed my socks with my towels and sheets…they come out cleaner). My mom always told me the sock would go into another dimension (or the twilight zone). Yeah my kids are the same. A fridge and pantry full of food and they moan there is nothing to eat. Because apparently “ingredients” don’t count. For years, the first thing my husband would do when we visited his mother was check her fridge for leftovers. Didn’t matter if he’d eaten or not. I thought only 15 year old nephews did that. Because they’re always hungry! Yep, if it has to be cooked, there is nothing to eat. I feel your pain. If it’s in the wrong place I can be starring straight at it and not see it because it’s out of context. This works with people too. I feel your pain. As a librarian, I even alphabetize the cans. Is it wrong that I really want cheese balls, now? It’s really not fair that the only visible part of the corn is the plain end of the cardboard box well above head height. That pub mix really make a good salad topping, just saying. We are doing an impromptu remodel of our bedroom that involves replacing the floor, and are in the tear it apart stage. Everyday I come home to find furniture moved and its contents scattered over the rest of the house. I so feel your pain. First, I love your pantry! And second who puts cans on the top shelf? That’s just dangerous! As I have aged I have turned into Wonder Woman. I often wonder where in the heck I put something! There’s an organizational trick I learned at work – the most often used items should be stored closes to “point of use”. The less often something is used, the further away it is. This has lead me to the “dust decision” process. If I use something often, it doesn’t get dusted. When I had to downsize it was easy. The dustiest was the first to go. Plus, it means less stuff to dust, should I ever design to dust. Oh, that’s brilliant! My life has suddenly become much simpler — thank you, Nancyc! Anytime I have work done in my house it’s a reason to reorganize. My older brother use to do that. Drove me and my mom nuts. There would be something my mom got at the grocery store and told all of us that it was for company coming over so don’t eat it. She put it in the pantry knowing where it was. So…my ever “helpful” brother (who was 6 feet tall) would put it on the top shelf so it wouldn’t get eaten. Then my mom would say “where is the stuff I bought?” I would look at her and say “don’t know”. My brother (the one who moved it) said “don’t know”. Then a few minutes later I would see it and say “it’s on the top shelf”. My mom would yell my brother’s name to get it down. Then she would glare at him because he would look sheepish at being busted. Goody Snacks at the home of someone who won’t eat them, is genius! I feel your pain, Alas one must learn to adapt. Neighbors not home … call a friend … sister NOT a brother, they hang up on me. The Age A D D thing BUSTED. But you learn, never more than 3 distractions or you end up Spring/Fall cleaning the whole house. I friggin’ LOVE the Innkeeper series. Love it so much that I’ve gone and bought the first two books, after having gotten my first copies from the library. Just finished the third (for the second time, mind you, as I have w/ all of them). And religiously check your Innkeeper site to see if there’s something new. Now I’m trolling through your blogs, seeing if there’s anything that you’ve written that I haven’t read yet. And – THANK YOU! – I do so appreciate it when you share another author’s work whom you really like. Ilona, much love – and I do hope that your hands heal gently and easily. I, like you, make my living writing – totally different scope, genre, audience, but yes. I get it about the hand thing. You’re in my prayers. Both of you – I LOVE your work. Understand that it is grueling. Thank you for doing it. I’ll wait more-or-less patiently for your new releases; don’t want to pressure you at all because I DO want you to heal up and get rested and all zesty and juicy once again … but yeah. Still looking for the next one. Be well, you two. Thanks! – A. Thank you for all of your books too! You guys are amazing! Thanks for the laugh! So good to know I’m not the only one who does this (puts things in a specific place). Things out of their ‘space’ tend to go to the twilight zone for a week or two. Aaaaaaaaaaaagggghhhhh! The HORROR! Definately feel the pain, right on par with setting your (legally req’d to drive) glasses down without thinking & then not being able to see to find them so yes you will be late to where you were going…..
i would have never looked on the top shelf. who puts cans on a top shelf? I have been reading this since it started and have had so many laughs. I thank everyone. It really is good to laugh. Seriously. Your pain is felt. This has puzzled me for days…since I first saw the blog post. What IS “pub mix”? ?